The Electro Eye Hye System offers unique design and operating characteristics unattainable with conventional remote reading equipment. Specifically, electrical actuation means that the Electro Eye Hye can operate virtually any required number of level indicators at whatever distances and locations desired. A wide variety of indicator types and sizes allows the proper indicator for each monitoring situation. In addition to monitoring liquid levels, the system can also actuate fuel cutoff interlocks and alarms, energize solenoid valves, or control pump motors all at pre-set liquid levels. With proven reliability and accuracy in thousands of installations world wide, the Electro Eye Hye System offers the most effective, easily installed and maintenance free remote level gage performance available today. The Electro Eye Hye System is most frequently applied to monitoring levels in boiler drums. Other routing steam generating applications involve feedwater heaters, flash tanks, deaerators and turbine drains. Additional applications are possible where liquids can meet minimum electrical conductivity standards, including operations in hazardous atmospheres. Control Unit plug in electronic modules accept level reading signals from the Probes and activate corresponding lamps in remote level indicators. Electrically activated indicators are easily installed in locations best suited for observation by operators. Many models offer choices in size, number of lamps and single or bi color indication. THE ELECTROLEV Four Standard Models Provide 10, 12, Or 20 Level Reading Locations Optional Models With 5- 24 Probes Available. CHECK OUT EYE HYE COMPONENTS AND MODEL NUMBERS HERE ! Control Units can be equipped with differential or "Dead Band" relays which have the capability to turn alarms or other electrical controls "on" at one level and "off" at a different level. Set points corresponding to any Probe "activate" or "deactivate" levels can be selected and changed in the field. For example, the high alarm can be sounded when the liquid level reaches the highest Probe in the Electrolev. The high alarm can continue to sound until the liquid level drops below the second highest Probe. This type of alarm actuation eliminates nuisance alarm trips caused by levels that flirt with alarm sensing devices. Repetitive printouts from sequential events recorders are reduced as well. Designed to plug into control unit receptacle for testing each level independently or cumulatively. Can be used to assist programming the 4-20 mA option. (Electro EYE-HYE) level indicators are employed . Also, the direct reading drum gage (Simpliport-shown to the right) may be closed off but kept serviceable. 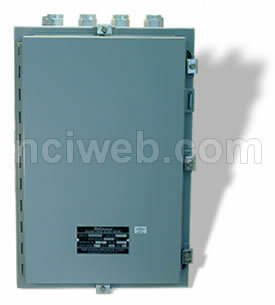 This dual gage design offers savings in space, equipment and maintenance costs. System simplicity begins with direct to from mounting of the Electrolev. All pressure connections are limited to the vessel area, resulting in the eliminating of long pressure lines, compensating devices and extensive hardware. For cold liquids, no bleeder lines or drip valves are required. Typical Arrangement. Click To Enlarge ! The Electrolev can be virtually any length desired, allowing Probes to cover a wide variation in liquid levels. The chamber will accommodate Probes at customer specified locations. Four Electrolev models serve steam pressures to 3000 psi. Standard Electrolevs offers 10, 12 and 20 Probes but other Probe numbers between 5 and 24 can be specified.